There’s buttons AND a collar! It’s a dress, not a skirt. Although it’s by no means perfect, I’m SO PROUD of myself for finishing the dress in a weekend and not giving up. It was a very frustrating experience but it has inspired me to keep trying! 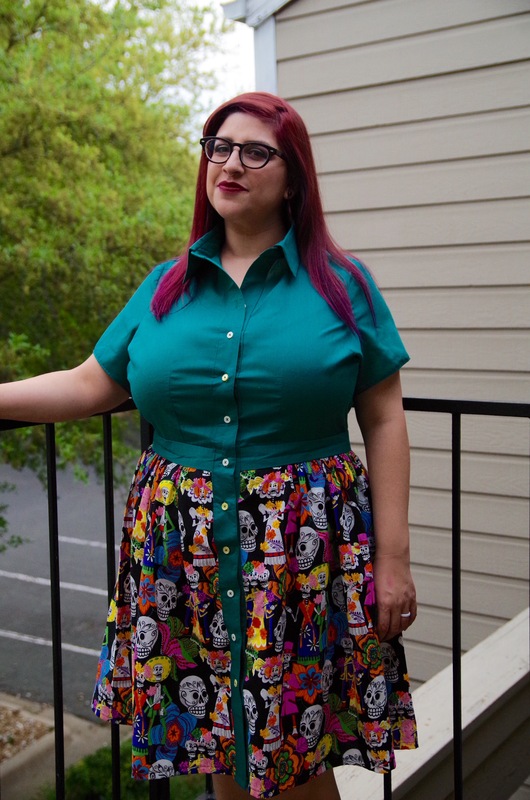 I used my high bust measurement (size 18) and graded it out to a size 24. Even though the pattern has custom cup sizes (I used D) , I should have done an FBA. I was scared, so I didn’t do it. *WHOMP WHOMP* The pulling across the bust is not preferable but like I said, not bad for a first attempt! The front darts need to be lowered the next time around. The side darts are protruding…if you know how to prevent that, HOLLA! I need help. I’m pleased with the outcome though. I added an inch to the bodice length and I’m glad I did. What you’re seeing is a slightly different version of View B, with a dirndl skirt instead of a pleated one due to the fact that I didn’t have enough fabric. I like the look of it with a dirndl though. I purchased 4 yards of teal broadcloth at Hancock Fabrics for $1.99 a yard expecting the whole dress to be teal. Due to the fact the fabric was horribly off grain, I had to scramble and find some fabric that could work with the teal for the skirt since the fabric store was already closed. I swear I’ve had two yards of this 100% cotton novelty Dia De Los Muertos fabric for at least 4 years, waiting to do something awesome with it. By the way, I only had the first page of directions so I had to figure out how to sew the collar and placket. I need to be better about keeping my sewing stuff in one location. Expect some more cotton and funky prints to come. I will sew this dress again, once I figure out the rest of the fitting issues. I’m currently working on Simplicity 8096 View C, an Amazing Fit dress that goes up to a DD cup! Can’t wait to show it to y’all! Amazing! 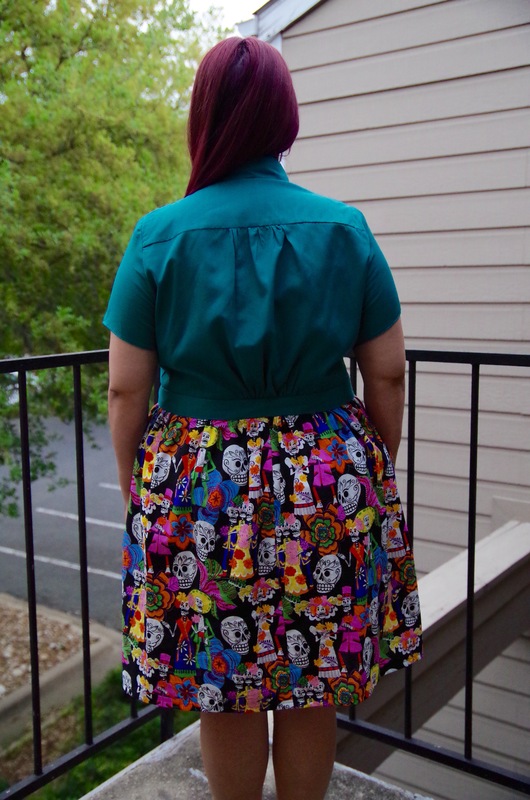 I love the sugar skulls fabric. And the dress looks great with your hair. Can’t wait for the next piece. This is wonderful! I am so impressed at you working out the collar by yourself! I am still always confused by collars. I love the gathered skirt, too. It looks lovely, and those colours are so great on you. FBAs aren’t scary, I promise! Once you’ve done one or two they’re very easy. The first one is confusing though, and you have to go slow and find a good tute (I like Mary from Idle Fancy’s tute but there are plenty if you google, so you can find one that works for you). I was also nervous about it and put off learning for…. years. So I only made skirts! 😛 I can see with my sewer’s eye that it’s pulling at the front but I think if I didn’t sew I wouldn’t notice it. An FBA would help but it looks like it fits ok without. Does it feel comfortable to wear? Thanks for the lovely comments and your response! I’ll give Idle Fancy a look and I’ll hopefully overcome my fear of FBAs soon. Luckily it’s still very comfortable to wear, even though it’s way too tight across the bust. I’ve been sewing so many skirts for too long so I’m ready to make actual dresses that aren’t knits only. I’m hopeful!